Deacon Ralph Torrelli serves in the Diocese of Biloxi, Mississippi, and directs the diocese's continuing education program for deacons. He is the author of four pamphlets in the "Come Holy Spirit" series published by Liguori Publications. He also writes the Scripture commentary column for the Gulf Pine Catholic, the newspaper of the Biloxi Diocese. He and his wife, Mary, live in Hattiesburg and have two children and three grandchildren. Heartfelt prayer is effective! 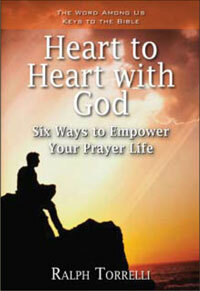 In Heart to Heart with God, readers explore six attitudes or actions that will bring passion and life to their prayer and give them confidence that God still acts powerfully in the world today. Deacon Ralph Torrelli shows us how to pray the deepest desires of our hearts and how to arm ourselves to fight the spiritual battles of the Christian life. He also encourages prayer that is persistent, bold, expectant, and specific, and includes real-life testimonies of God's amazing responses to such prayers.